A brief history of Sleeping Children Around the World's founder, Murray Dryden. You can also watch in high quality. 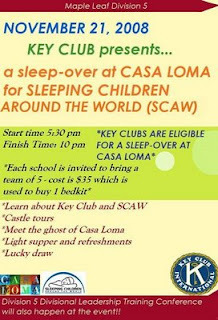 "Marc Garneau Collegiate has a Kiwanis Key Club one of the largest in the district of "Eastern Canada and the Caribbean" that is supported by my Kiwanis Club of East York - and they had a sleep-over earlier this year and raised over $3,000 for SCAW. 126 Bedkits are to be delivered and I had the opportunity of giving some of them out in Nicaragua in October." "Dave Dryden did a presentation at their annual convention and the students convinced the rest of the Key clubs in the area to make SCAW as their charity of choice for the 2008/2009 year!" "The students are now having a mega-sleep-over at Casa Loma this Friday and Dave has been invited to do a presentation, and I am going too." Click on graphic to see larger version. "I will have a table selling cards, calligraphy and small art works. All proceeds will be donated to SLEEPING CHILDREN AROUND THE WORLD." "I look forward to seeing you there." In our class, we learned about something called Pay It Forward, and we have been practising it. Pay It Forward is about doing something nice for someone for no reason. You just do something kind to be nice. Maybe the person whom you are nice to will do something nice for someone else. Then that person will do something nice for someone else, and it keeps on going. If we all do it we can make the world a better place. Sometimes it is just a smile or if a family member is sick, I make them chicken soup. This is all about an act of kindness. It can even save your life. When I was little (about five years old) a car almost hit me and my friend Stephanie, who was 11 years old. We were walking across the road. The car was coming, so she pushed me onto the sidewalk. The car hit her leg and broke it, but she was OK. I will always remember that she did such a good thing to help me, so I always try to be nice to other people now. It will make the world a better place if we even help one person a day to feel good. Pay It Forward is all about being nice to people. Sometimes we pay people back for what they do, but now we pay it forward so even if they are not nice to us, we are nice to them. We are paying it forward to the Sleeping Children Around the World because we have had a penny drive and raised more than $800 to send to the children who do not have a nice place to sleep. Last year, we raised more than $1,000. Maybe the kids in Africa will pay it forward to other kids. Sleeping Children around the World has a 2009 calendar celebrating our millionth bedkit. In Canada, you can order online with our PayPal Shopping Cart. Price ($20/CAD) includes mailing costs. Thanks to the generous sponsorship of Lynette Jenkins, the entire $20 goes towards buying bedkits. If you're not in Canada, you can order a calendar from the Lulu website for $20/US. We receive $5/US for each calendar you buy from Lulu. All photos, taken by our travelling volunteers, show some of the children receiving bedkits at our most recent distributions. Click on the photo above to see a larger version of the cover. All photos are shown in high resolution at the Lulu website. 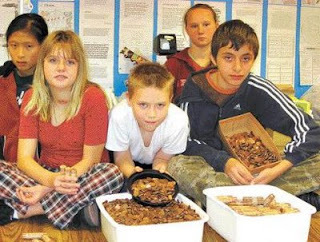 Sue Britnell of Kettleby Herb Farms writes about giving in her November, 2008 newsletter under the heading To Give or Not to Give? .... that is the question. "These times are certainly challenging and this has stirred a desire in me to give something back. I am thankful for my lifestyle, my health, my children’s independence and freedom to live their lives as they choose. I feel quite fortunate, I have a job/lifestyle that I love, family I can count on, great friends and I still have my sense of humour. Maybe we need to be shaken up once in awhile to appreciate what we do have and perhaps, consider what we have to give others." "So, I have spent this past while investigating charitable possibilities. This is not to say that I have not been charitable in the past, like most, I have donated to an assortment of charities in varied ways both personally and through Kettleby Herb Farms. …United Way, Red Cross, Salvation Army, National Institute for the Blind, Community Garden Programs, etc., but in these cases I have not initiated the donation, I have only responded to a request. This is something different to me…No, I am not in a position to write a big cheque…..I want to find something to which I can give a meaningful contribution in terms of time and commitment." From now until Christmas our new ‘Fab Four’ gift pack (pictured at right) (the perfect gift for the all the ‘cooks’ on your list!) will be specially priced at $35.00 (regularly $38.00)-see already a deal! To entice you even more, I will also waive our standard $4.00 handling fee on all orders that include this gift pack ….And finally to ‘close’ the deal… I will donate $5.00 from each sale of this gift pack to the ‘Sleeping Children Around the World’ Charity." Click on the photo to get all the details. Thanks Sue, and all your online customers. Doug MacDougald travelled as part of a team of six Canadians to help needy children in Bangladesh by distributing bedkit items to children who have never known the comforts of a proper bed. All team members travelled at their own personal expense to ensure that 8000 of the world’s neediest children would receive bedding items, clothes, mosquito nets and some simple school supplies. The team travelled throughout northern and central Bangladesh by various conveyances including rickshaw, barge, country steamer, baby taxi and van! Doug has made a passionate commitment to a Charity that has been supported for many years by his parents. SLEEPING CHILDREN AROUND THE WORLD has been a part of his life for the past 20 years. I addition to this, his father flew for the Royal Canadian Air Force and was stationed in what is now Bangladesh in 1944 and 1945. In a small way, Doug feels that he is returning home! 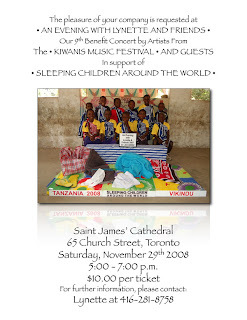 SLEEPING CHILDREN AROUND THE WORLD is an exemplary Canadian Charity which from its inception has distributed over 950,000 bedkits to needy children in 33 different developing countries. Its founders, Murray and Margaret Dryden, parents of hockey legends Dave and Ken Dryden established this Charity in such a way that 100% of all donations go directly to the child who receives the bedkit. The Toronto Star recently listed this Charity as among its top five in Canada! Also available for download as a PDF file. 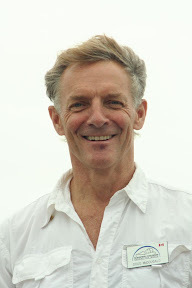 Click for high-res photo of Doug in Bangladesh. 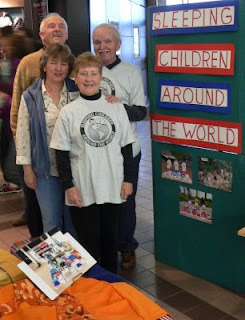 For the 15th year in a row, St. Thomas and St. George's Anglican Churches in Owen Sound have set up their display at the Heritage Mall to promote Sleeping Children Around the World and sell bedkits. Looking after things on Friday morning were (back row, left to right) Tom Hart and Carl Dickey, (front row, l to r) Gail Willcock and Pat Dickey. Helen Morrison of St. Thomas reports that 16 volunteers helped this year and collected 47 bedkit orders so far. Collection jars made enough for three more bedkits. The campaign is on until Christmas. Potential donors in Owen Sound can contact the churches for more information or a donation form. If you're not in Owen Sound, you can always download a copy of the donation form from the Sleeping Children website at this link. "An Evening with Lynette and Friends"
For further information, please email Lynette. You will also be able to buy the SCAW 2009 calendar at this event. Lynette Jenkins has sponsored the printing of this calendar in memory of her mother, Renée Dorothy Jarman, (pictured at left) and for all mothers everywhere. Our calendar shows children who have received bedkits from Sleeping Children Around the World in the past year and celebrates that in 2009 we will reach our millionth child. You can click on the graphic or this link to enlarge the poster, and you can see all the pages of the calendar at the Lulu website. Mary McDonell is a teacher with the Brant-Haldimand-Norfolk Catholic District School Board. Mary, a musician and pianist was working to compile a collection of songs as a keepsake for her children. While growing up her boys would often ask Mary to play for them when they couldn't sleep. In the midst of the recording process Mary heard about Sleeping Children from Grant Clark during one of Grant's visits to Mary's school. As Mary says in the CD's dedication: "I couldn't imagine little ones trying to sleep on the ground every night without even a blanket. As a child, the worst I ever had to worry about, with nine siblings, was that someone might steal my pillow in the middle of the night." Click to see song listing. Like a Celtic knot, both of Mary's wishes tied in together. 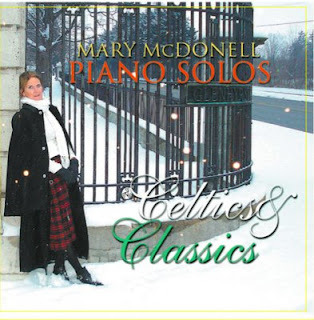 25% of the proceeds from the sale of her CD "Celtics and Classics, Mary McDonell Piano Solos" will go to Sleeping Children. The CD costs $20. 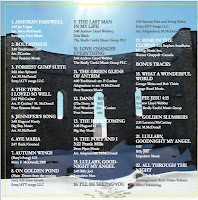 To get a copy of this CD, you can email Mary. She's looking after sales in Brantford, of course. And the CD will be available in stores in the area in time for Christmas. Mary's sister, Grace Armstrong, is the "agent" in the Perth area. Their mother, Gwen Morris, is busy selling the CD in Eastern Ontario. You can get a copy from members of Mary's family if you live in those parts of the province. 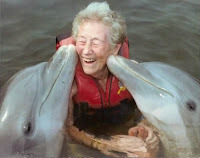 Mary says: "So far, the customer feedback is very favourable. My 85-year-old mom sells one every time she goes into Tim's, in the little town in Eastern Ontario, where she lives. She is pretty much captain of the selling team as we speak."